We're meeting in Seattle on March 28-30! For those in Seattle, we'll be meeting in the Community Data Science Lab (UW) (CMU306) and in CMU 322 which is just down the hall. If you're going to be calling in, you can find us in the CDSC Jitsi. You should also participate in the shared note taking. 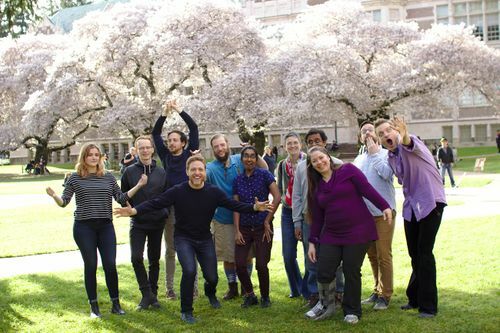 CDSC members at UW April 2018 meetup. Photo (CC BY-SA) by Sage Ross. Another group meetup/retreat is upon us! Our tentative plan is to get dinner together on Thursday if folks are in town and available. On Friday morning we'll start with a small number of research presentations from affiliates and visitors as a way of getting to know folks. After those, we'll move into critique and feedback sessions followed by some evening fun. On Saturday we will host unconference sessions on whatever folks want to talk about and/or work on. As always, the plans may evolve shift. For the first time, we're planning to invite a small number of more formal talks from CDSC affiliates and visitors. There are two goals with these presentations: (a) introduce yourself and your research interests to the group; (b) present finished research to teach us something new! We've got a maximum of ~20 minutes per presentation (and it's a hard maximum) but you are welcome to use less time—especially if you are interested in presenting unfinished work in a C&F session. For the critique and feedback sessions we're expecting everybody who wants to participate to submit (a) something in writing (e.g., a paper, a Matsuzaki outline, an extended abstract) and (b) a list of questions or types of feedback you want. Please only submit something you want feedback on! If you want to participate, you need to email something to collective@communitydata.cc by the end of day on Friday, March 22. Not everybody needs to participate but anybody who does participate should only submit one thing. We're expecting that everyone attending will have read all the material submitted and will bring notes to the meeting. When we meet, everyone who has submitted something will get at least half an hour (more if possible). When we meet, these sessions will be run with no presentations and no formal introductions. The plan to just jump in and start answering the questions and talking about thing we've all already read. Take the entire group as an audience: the best feedback is beneficial or thought-provoking to the group as a whole, prompts group discussion/consideration, asks a question, etc. Don't dogpile -- time is short, so even positive plus-ones should be brief: don't repeat what others have said, don't feel the need to chime in or pile on a critique: it is assumed that you read the paper and are supportive of the author. Avoid vaguebooking. "Framework needs some work" or "Lacking some flow" isn't as useful as "I don't think you're getting a lot out of using Foucault, Latour, and Habermas here, and explaining them is pretty heavy -- maybe you can get away with just invoking Benkler and moving on" and experience-grounded comments like "When you transitioned from section 2 to section 3, and half-way through section 4, I ended up flipping back to the abstract to figure out what was going on". Don't narrate the typo you found on line 156: feedback best conveyed via a marked-up draft should be delivered via a marked-up draft. Please add your name below if you think that you'll be attending any of the meetup's events! Also, if you'll be traveling and/or have food requirements, please fill out your information in the Accommodations section. If you are planning on presenting during the critique and feedback sessions, add a "C&F with optional details next to your name on the list below! Not everybody will present so don't feel pressure to sign up. Links in the table below are all protected by a username/password that should be in your email. Everyone attending should plan to be around and available from Friday, March 29 8:30am (ideally, Thursday evening/afternoon too) through Saturday, March 30 3:00pm (including Friday evening). There is an optional (but extremely fun!) get-together on Thursday, March 28 6:30pm that will involve dinner. Example Person: Can host two people, one on futon, one on a comfy couch. Both in my living room. Nate: Can host 1 person on a couch (2 if really needed -- air mattress). I won't be in Seattle before the 28th. Aaron mostly pesc/veg; allergy to sesame, most nuts (almonds and peanuts are fine). Abel Flexitarian. Prefer vegetarian meal if there's available. Status: Purchased both national and international tickets. Notes: About lodging, I booked a hotel in Seattle from 26 to April 1, but can be cancelled very easily. I haven't got any housing for Chicago yet.